As summer comes to a close here in Australia, I'm saying a sad farewell to the long days, warm weather and beach walks I've enjoyed these last three months, but all is not lost. With cooler weather comes cozy scarves, hot chocolate (the vegan variety, of course), and hearty, winter meals. I decided to create my own vegan gravy for the this recipe, and was really happy with how my mushroom based version turned out. It's got a deep flavour and lovely texture, rivaling any non-vegan version you've tried. 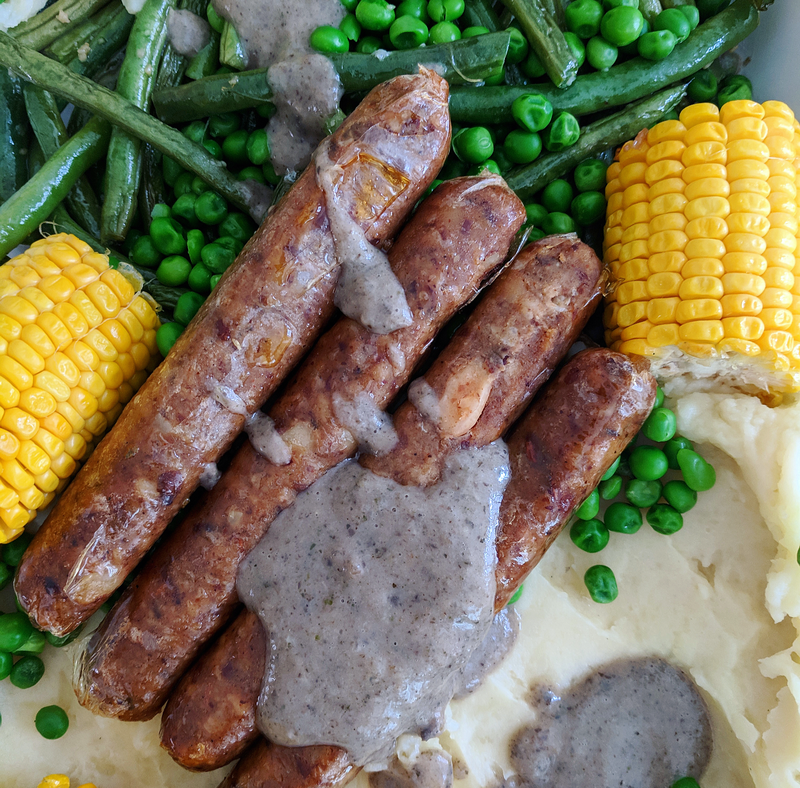 My Vegan Bangers and Mash makes for a fantastic winter warmer, with creamy mash, roasted veggies and spicy sausages, made by my favourite vegetarian butcher, Suzy Spoons. Their smoked chilli sausages are so meaty and smokey, and are free of gluten, onion, garlic. They make the perfect addition to this hearty meal, so pick up a packet and start cooking! Fill a large pot with water and a pinch of salt, and bring to the boil. Add potatoes and cook until soft. Drain the water, then add butter, milk and salt and mash with a fork until as smooth as you like it. Place mushrooms, oil, butter, onion and garlic into a large frying pan and cook until mushrooms and onion start to soften. Meanwhile, combine water and stock cube and leave until stock cube dissolves. Add stock, herbs and cornflour and mix until well combined. Leave to cook for approximately 20 minutes. Remove from heat and using a handheld mixer blitz until smooth. Steam peas until cooked through. Combine all ingredients in a baking dish and cook at approximately 180 degrees Celsius until cooked through. Place sausages onto a baking tray and place in the oven (still at 180 degrees Celsius) for approximately 20 minutes, or until cooked through. Assemble all components onto a plate and drizzle with gravy. Serve hot.